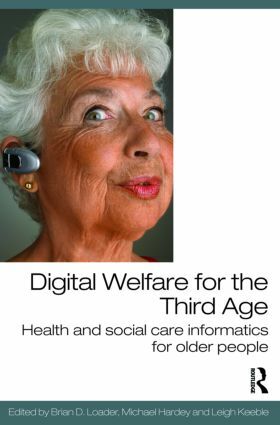 This book is about the ways digital technology can contribute to the welfare of older people. The Internet, mobile phones and other technologies have changed how we live and work. Such technologies also shape how services for older people are organised in ways that potentially place carers and older people at the centre of service provision. Telecare can make homes ‘smart’ so that they are more comfortable and less risky for people who can take advantage of devices that help make them independent members of their community. Digital Welfare is part of the broader project in Britain and elsewhere to adopt new information and communications technologies (ICTs) to organise and deliver health and social welfare services. This includes mundane technologies like an alarm to call for help to complex telecare ‘smart homes’ and electronic patient records. The intended and unintended consequences of such new technologies must be explored if we are to benefit from these innovations. Based on recent research this book seeks to highlight and examine the new opportunities and dilemmas that confront older people and all those concerned with their welfare in the network society. This edited collection provides original contributions from leading academics and researchers in the field to access the evidence for improved professional integration and user-centred health and social care services for older people arising from health informatics. Digital Welfare for the Third Age will be of interest to all those working with older people. Part I Towards integrated service provision? Are there limits to the integration of care for older people? Networked carers: Digital exclusion or digital empowerment?